Before December 30th of 2004, krypted.com was a site with some flat files of notes I’d taken. During the Holiday break that year, I finally converted it into a blog. And now, with over 3,500 posts and netting around 10,000 unique visitors a day, it’s very different. It started out as just some musings and technical notes. Now, it’s… Well, some musings and technical notes. Actually, back then I’d occasionally write about college football (Go Dawgs! ), a lot more about Windows (um, Windows NT sometimes – ick! ), and an increasing amount about macOS Server. These days I post less, but I write as much as I ever did. 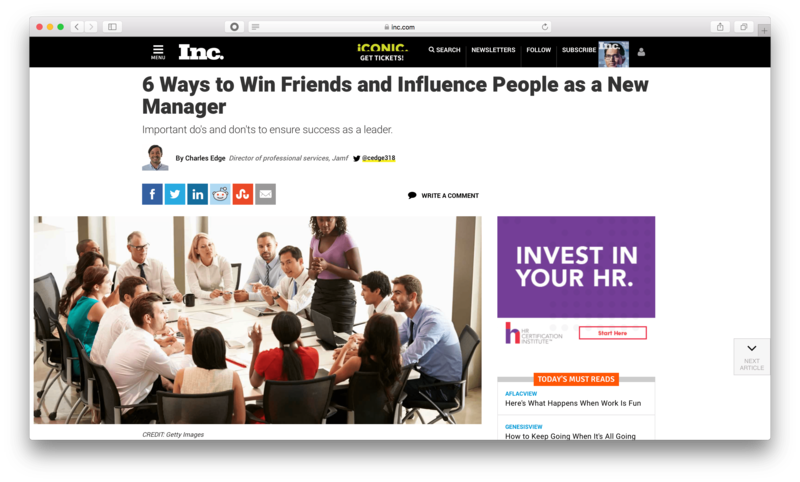 Just more are links to articles I’ve written for other places (Medium, Huffington Post, Inc.com, Jamf, etc). Also, there’s more that’s up on GitHub and contributions to projects at work and for various vendors we all know and love. And there’s more structure, as with the macOS Server guides. Overall, I still love to write, just my interests shift here and there. And a Happy New Year to those who observe tomorrow as the end of the year! It seems like every time I turn on the radio, there’s an ad for an email marketing automation tool. 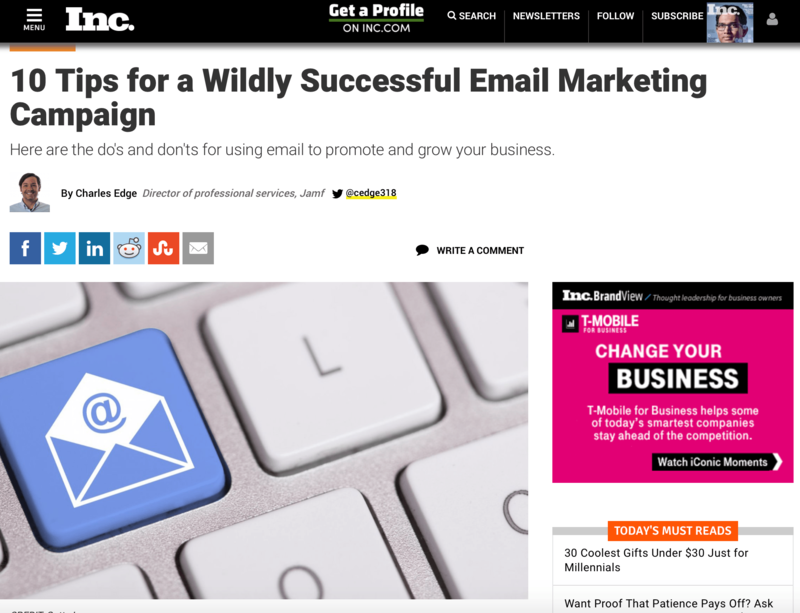 Constant Contact, Mailchimp, Emma, iContact and even Salesforce make it pretty easy for small and mid-size businesses to automate beautiful emails. Or for larger organizations, there are offerings like Marketo, Adobe Marketing Cloud and Eloqua. But while the ads make it sound like these campaigns write themselves, they don’t. 1. Choose an email automation tool that fits the size of your marketing team. Many of the more robust products really need a staff person at the reins. If you can’t afford someone in that position, then turn your attention toward simpler software that requires little overhead. I’m a tech writer. I write about #nerdstuff. As a rule, I don’t write about politics. But this isn’t political. 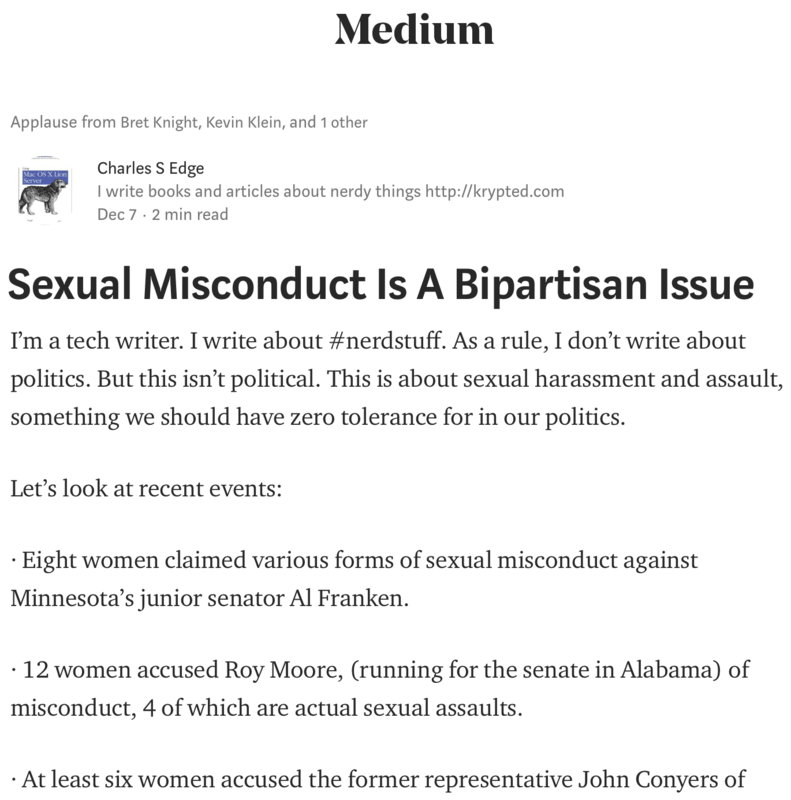 This is about sexual harassment and assault, something we should have zero tolerance for in our politics. Call it the New Sheriff in Town Syndrome. You’re a new manager at an established company or your own startup. You think of yourself as a fixer, so you quickly set out to implement changes or new processes, often bringing in ideas from your old company. While making improvements should be the goal of any manager, you need to be careful. It’s easy to come across as over-aggressive and disruptive, and you could end up alienating many of your colleagues. Source code is a collection of computer commands and comments written in a programming language, like Java, C or Swift. When compiled, the raw source code is then no longer human readable but runs very efficiently. Because compiled code isn’t easily disassembled, people cannot create their own versions of the software. Once upon a time, organizations needed a copy of source code, in case a software vendor went out of business. 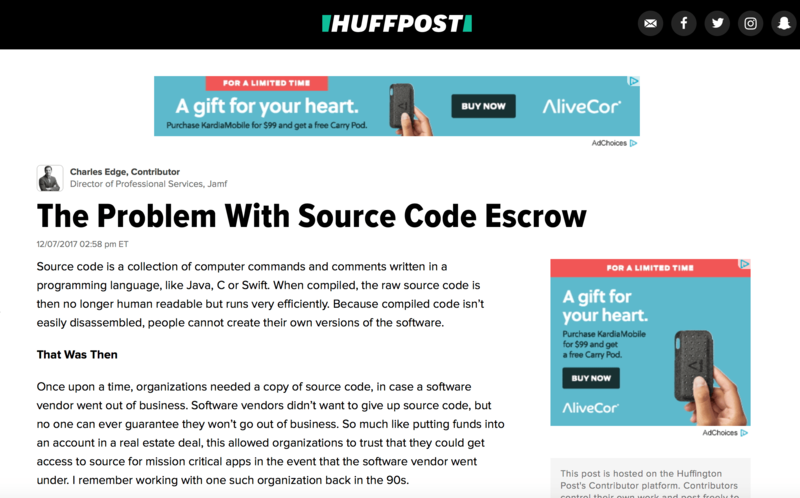 Software vendors didn’t want to give up source code, but no one can ever guarantee they won’t go out of business. So much like putting funds into an account in a real estate deal, this allowed organizations to trust that they could get access to source for mission critical apps in the event that the software vendor went under. I remember working with one such organization back in the 90s. It’s baaaack! The holiday peak season for retailers is almost here. By the time jack-o’-lanterns start to appear on front stoops, businesses’ preparations for this busiest period of the year should be well underway. In 2016, holiday sales represented nearly 20 percent of total retail industry sales nationwide for the year, according to the National Retail Federation. To read more, see https://www.inc.com/charles-edge/holiday-traffic-rush-is-right-around-corner-here-are-ten-useful-tips-to-help-you-prepare.html. https://www.inc.com/charles-edge/complacency-is-a-curse-heres-how-to-avoid-it.html. This piece focuses on what to do when things are going really good in an organization: more work! Running a company can be really hard. But when everything lines up just right, you hit a stride. The business feels like a well-oiled machine and almost seems to run itself. This is true not just for startup entrepreneurs but also for people who lead departments in larger organizations. But of course, business is never really easy. Just when you’re riding the wave, a crash always lurks up ahead. So if you’re fortunate enough to be in a positive place with your business, understand that this is the very time to become uncomfortable and take a hard look at every aspect of the operation. A business should always be thinking about how to reinvent, even when the revenue is rolling in and morale is high. 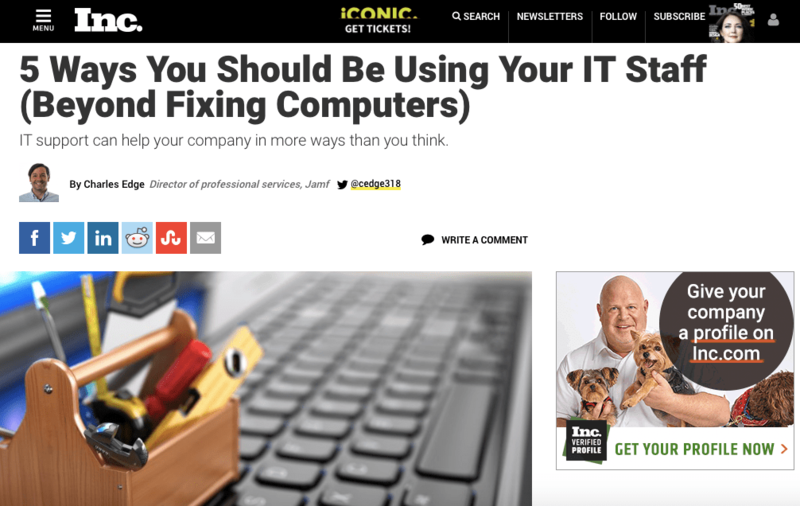 My latest @inc piece is up at https://www.inc.com/charles-edge/5-ways-your-it-staff-can-make-your-business-more-tech-savvy.html. Remember Nick Burns, the “company computer guy” played by Jimmy Fallon on “Saturday Night Live”? IT people have long been fixtures in the office (though hopefully seldom as grumpy as Nick). However, their jobs have been radically changed by two trends — the cloud and consumerization. The cloud has amplified what a small business can do by moving the physical server and network infrastructure that staff or consultants used to be needed to manage, to off-premises locations. 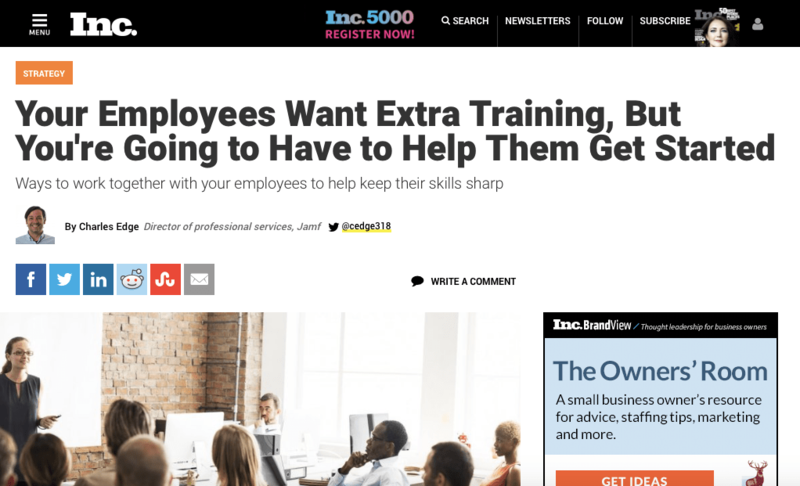 To read more, see https://www.inc.com/charles-edge/5-ways-your-it-staff-can-make-your-business-more-tech-savvy.html.